Concept have been at the forefront of artificial smoke generation technology since 1962. Specialising in systems to meet the rigorous requirements of the industrial, military, security and clean room industries. Concept have built up an enviable reputation for high quality, high performance smoke machines & have gained unrivalled experience. The Warsash Maritime Academy is a world-leading maritime training college and a faculty of Southampton Solent University. The Academy's campus is set beside the River Hamble and comprises of classrooms, accomidation and training simulators, including the only manned model facility in the UK. The courses on offer cover a wide range of first-class maritime education and training, from deck and engineer officer cadetships, including degree pathways, to senior officer certificates of competency, together with the associated safety training. In 1942 the school moved to it's current location Warsash, a new Fire Training School was built to provide professional fire-fighting skills to mariners and later to those serving in the offshore industry. Today, the fire school facilities include a BA (breathing apparatus) training unit, a hot fire training simulator, a helicopter fire fighting & rescue unit and a confined space training unit. Experienced Master Mariners conduct the theory sessions and these are followed by practical exercises on the fire ground and the fire fighting unit. 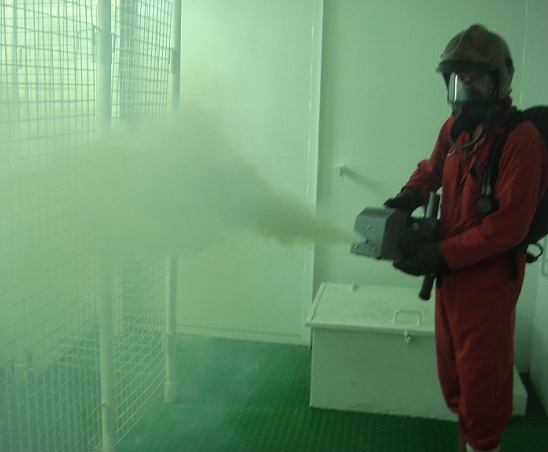 For over 25 years, the fire training team at Warsash has been using the Concept Colt 4 smoke machine to add realism to confined space exercises on both the basic, advanced and off-shore fire fighting courses. The Colt 4 has evolved during this time, in terms of design and performance, the Academy now uses the Colt 4 Turbo, a powerful hand-held smoke machine which produces a non-toxic-controllable and persistent smoke. Participants are initially taken through the two-story ship / off-shore simulator model with normal visibility, then taken through again, individually, with lights on and when a light haze of has been laid down. Finally, they are organised into teams of 4 (wearing escape hoods) who then have to negotiate their way through the simulator which, has been entirely smoke-logged by a Concept Colt 4 Turbo. In 2004 Concept Smoke Systems were commissioned to come up with the design and installation of a smoke distribution system for the Urban Search and Rescue facility at the Fire Service College. 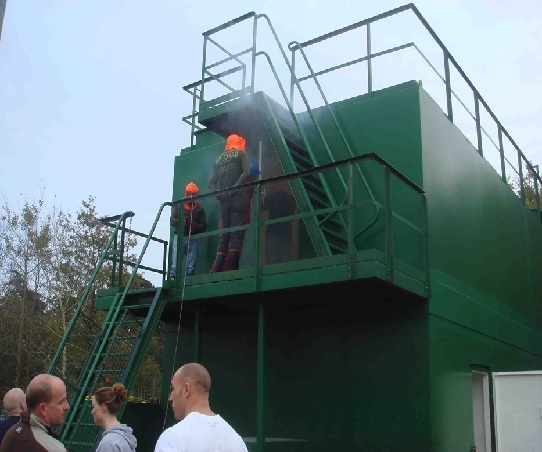 The extensive, primarily external facility is designed to be representative of a scenario after an urban building collapse, and, depending on training scenario being run, smoke was required to be emitted from one, two or three zones under the pile. As an outdoor environment, with a requirement for the smoke to remain visible and hang over and around the rubble pile (given the right environmental conditions), the ViCount 5000/180/2.2 kw smoke system was selected as the most suitable system. The ViCount produces a tremendously persistent food quality oil based smoke ideally suited to large volume and external applications (where water based smokes would simply evaporate too quickly). Concept suggested the smoke be ducted through heavy duty 110mm MDPE or thermoplastic ducting from a plant room area where the smoke generators ( 3 off) and matching centrifugal blowers were to be mounted. The smoke systems and their respective fans would be operated via a PLC to enable them to function automatically given the training scenario chosen. In effect each ViCount / fan combination supplied smoke laden air down a branch and sub branches) of 110mm high strength MDPE ducting, into which up to 16 smoke outlet holes were drilled along its length (35m). In effect, beneath the rubble pile, approximately 110 m of ducting was laid with a total of 45 smoke outlets, split amongst the 3 main branches. There was a continuous though slight fall in the ducting back to the smoke generation. The Ducting was laid on a prepared surface beneath which a number of passages and crawl ways were constructed. It was suggested that a damp course membrane might be beneficial to prevent egress of smoke deeper into the prepared surface, but it was deemed to be unnecessary. A staged multi-vehicle accident in the Hatfield Tunnel, involving a road tanker, 2 lorries and a minibus took place in October 2011. Concept's ViCount smoke system produces the world's most persistent artificial smoke, critical when you are looking at smoke travel over several kilometres. The operation was designed to test the responses of the emergency services and the tunnel video smoke detection and ventilation systems. Three ViCount systems were used to smoke log the entire tunnel section. The tunnel video smoke detection system rapidly detected the initial smoke production and the tunnel operator then contacted the various emergency services and instigated the tunnel ventilation plan associated with such as incident. Smoke was produced continuously for 2 hours for this multi-agency emergency exercise. A senior member of the exercise team concluded "A very impressive simulation!" A video clip (click here) shows the effect of the impulse ventilation system. Concept were commissioned by Westfield’s to produce a thermally buoyant smoke effect within the siding complex in order to verify the performance of the smoke detection and smoke extraction system. The equipment used; ViCount 5000 / 180 / 1.7kw smoke generator, stainless steel deflector plate, smoke oil 180, propellant CO2 gas, calibrated temperature sensor / thermocouple and space heater. The distance between the space heater and the deflector plate was set to give a reference air temperature at this thermocouple of 35 - 40ºC (from a deflector plate temperature of approx 190 – 200ºC), sufficient to give thermal buoyancy to the smoke effect without damaging the lighting fittings or operating the sprinkler heads. The Deflector Plate was pre-heated by the Space Heater for 90 secs, and the required reference temperature achieved. At this time smoke from the ViCount smoke system was introduced onto the Stainless Steel deflector plate via an extended Stainless Steel Ducting Adaptor, entraining the smoke in the hot air stream created by the Space Heater. This test was carried out at 6 nominated locations. The resulting smoke effect was consistently buoyant. In all cases the VESDA smoke detection system activated, and the Smoke Extraction system cut in. As an observation it was noted that the smoke effect was largely restricted to the higher levels, leaving the walkways which would be used for evacuation purposes substantially clear of smoke. Numerous issues relating to the interaction of the ventilation system and the smoke detection system could be identified and addressed.